Just wanted to share a quick tip with you that I’ve found very useful over the last few weeks – as I’ve been creating some REAL ENGINEERING MODELS. 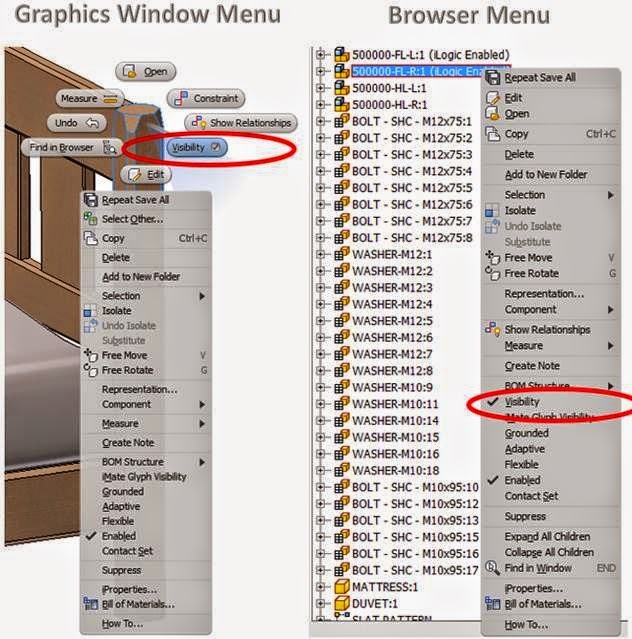 I’m sure we all know that you can easily access commands with a right click in the Inventor graphics window, or the browser tree. But (especially if you are looking at the browser menu) it can be time-consuming to trawl down the (long) menu to un-tick the visibility of a component. What to do? Well I must confess I never spotted this before. Thanks to Murray of Nottinghamshire (as he prefers to be known) for this tip. Looking at the menus above – you see that the first letter of some of the commands is underlined? These are your keyboard shortcut keys. So this means I can simply right click on any component and then instantly hit ‘v’ to make it invisible, or ‘g’ to ground or unground it, or even ‘I’ to quickly bring up its iProperties. Priceless. You might be surprised at how much time this can save.